Got into the Matsyagandha Express, a train that once met with a nasty accident on the Konkan Railway route a few years ago. The 437km ride promised to be uneventful, till I met a family who had inadvertently booked tickets for the previous day and realized their folly when they boarded the train. The good Samaritan in me burst forth like a blooming flower and I gave them my berth. And soon, I was trying to sleep, in container rack where they store blankets and pillows in an AC coach. Woke up early just as Matsyagandha left Udupi around 4.30am. There were like a million stars in the sky. Ok, probably a thousand? But loved the view… just amazing. 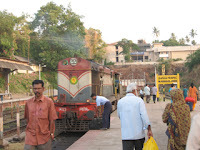 Matsyagandha trundled into Mangalore around 6.30 in the morning. Took a few snaps of the Erode WDM2 being shunted, before hitting the reservation office at Mangalore Railway Station to book a ticket to Cannanore (Kannur) in Kerala. Was told by the lady at the counter that it was better to buy it from the regular ticket counter on the day of the journey. Checked into the Hotel Hindusthan. Took a well-deserved break. Watched the animation movie ‘Open Season’ at an Adlabs theatre at the hep Bharath mall in Mangalore. Did some shopping before hitting bed. MTV blaring as always. Type ‘Mangalore’ in the ‘search tags’ field in the top right corner and click ‘Go’.